Today the Church celebrates the memorial of the Presentation of Mary. The three feasts of the birthday of Our Lady, the holy Name of Mary and her Presentation in the Temple correspond in the Marian cycle with the first three feasts of the cycle of feasts of our Lord: namely, Christmas, the Holy Name of Jesus, and His Presentation in the Temple (February 2). "Sacred Scripture contains no text concerning the event commemorated in today's liturgy. For something of a historical background one may consult the apocryphal works, particularly the Protoevangel of St. James (ch. 4:1ff). After an angel had revealed her pregnancy, Anna is said to have vowed her future child Mary to the Lord. Soon after birth the infant was brought to the sacred precincts at which only the best of Israel's daughters were admitted. 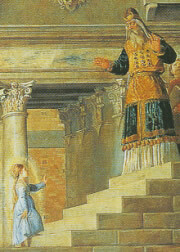 At the age of three she was transferred to the temple proper (7:2). According to legend, here she was reared like a dove and received her nourishment from the hand of an angel (8:1). "In the East, where the feast, celebrated since the eighth century, is kept as a public holiday, it bears the name, 'The Entrance of the Mother of God into the Temple'. It was introduced at Rome by a Cypriotic legate to the papal court of Avignon in 1371. In 1472, Sixtus IV extended its observance to the whole Church. Abolished by Pius V, it was reintroduced some years later (1585)." Meditate on the mystery of Mary's temporary dwelling in the sanctuary of the Old Covenant as a preparation for the approaching season of Advent. Locate the order of contemplative nuns closest to you and visit their monastery (you may want to request their prayers and you might consider supporting them financially), they are the privileged souls who, by the grace of their vocation, are even here below dwellers in the house of the Lord. Spend 30 minutes reading the Bible.